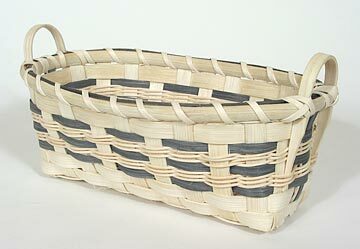 New for 2007, the Mini Loaf Basket is perfect for the holidays. 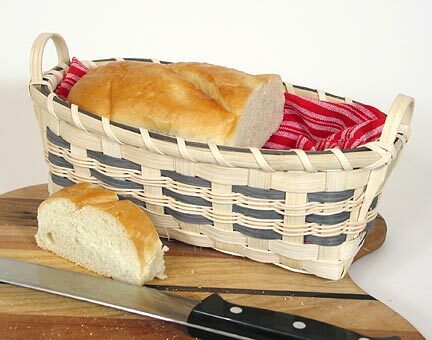 Imagine your friends’ delight to receive this basket - made by you - filled with your fresh baked bread or other goodies. They’ll enjoy using your basket year after year. Calculate Supplies for 1 to 20 Mini Loaf Baskets with the Basket Supply Calculator. The Supply List gives you the least expensive way to purchase the supplies for your quantity of baskets. View on-line or print to your printer. Cut 3 stakes 19” long and 9 stakes 14” long from 1/2” natural flat reed. Cut 2 base fillers 12” long from 1/2” natural flat reed. Cut 1 piece 26” long from 1/4” Forest Green flat reed. Mark the center of each piece with a slight pencil mark on the rough side. 1. With rough side up, matching center marks, place one 19” long stake horizontally and lay one 12” base filler on each side. 2. Center the 26” long 1/4” Green piece (smooth side up) over the long stake. 3. With rough side up, matching center marks, weave one 14” stake perpendicular to the 19” stake and fillers. Weave over fillers and under 19” long center stake. Mark center intersection with a twist tie. 4. Weave another 14” stake to the right of the center 14” stake, aligning center marks and spacing it a slight 1/2” from the center stake. Weave this stake under fillers and over 19” long center stake and 1/4” green. Repeat with one stake to the left of center. 5. Alternately weave the six remain 14” stakes across the horizontal stake and fillers aligning pencil marks. You’ll have four stakes on either side of the center stake. Space each stake a slight 1/2” away from its neighbor. Push long horizontal stake and fillers tightly together with no space in between. Adjust stakes so that length of base is 8” and so that 14” stakes are an equal distance apart. 6. Weave one 19” long stake to either side of base filler, rough side up, aligning center marks. 7. Dampen fillers at the edge of the base, then crease them along the edge. Trim ends of base fillers to a length of about 1 3/8” from the crease. 8. Cut filler through the center (dashed line above) to the crease making 2 narrower ends. Spread ends apart and tuck under the second stake from the crease. 9. 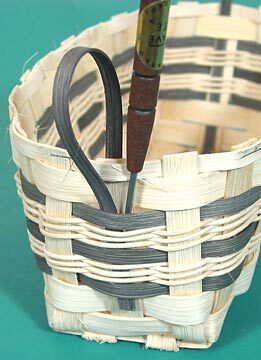 Soak base and upset your basket by creasing every stake at a right angle to the base. 10. When weaving the sides, spray stakes as needed to keep them pliable. 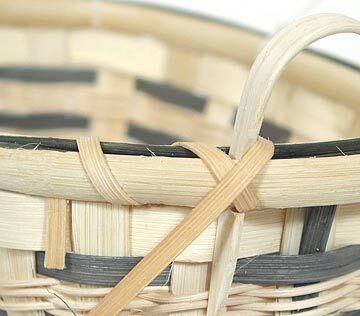 Soak each weaver before placing it into your basket, soaking the dyed reed in a separate container. 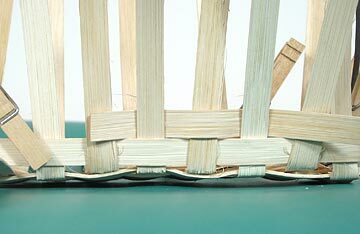 Weave each row of flat reed with the rough side to the inside of your basket. 11. 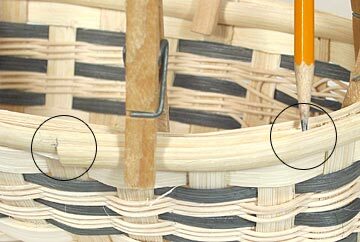 Begin weaving by placing a piece of 1/2” flat reed on the outside of the third stake from a corner (on a long side of your basket). Note that this stake passes under the edge of the base. 12. Continue weaving with the weaver on the outside of every other stake. Use clothespins to hold the weaver in place. 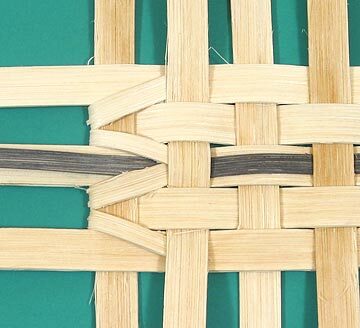 Finish this row by weaving over the beginning of the weaver and continue to weave for 3 more stakes. Cut the weaver so it will hide behind a stake. 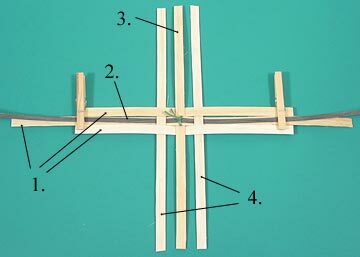 The two ends of this weaver will overlap each other for a total distance of 4 stakes. 13. 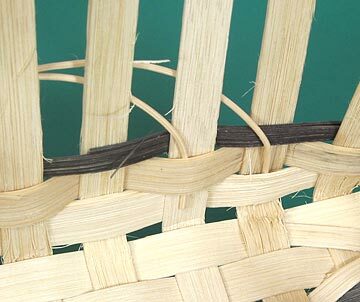 Start the second row with 1/2” flat on the other side of the basket and finish it as described above. 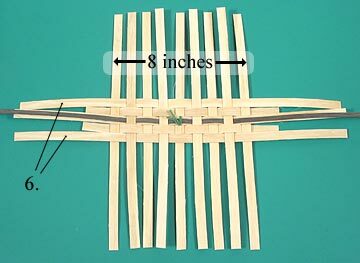 Weave the third row in the same manner using 1/4” dyed flat reed. With your packing tool, push each row downward, leaving no space between rows. 14. 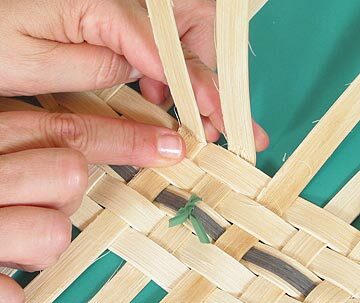 Soak two long pieces of #2 round reed in warm water for several minutes then anchor the end of each piece behind a row of weaving on the inside of your basket. 15. 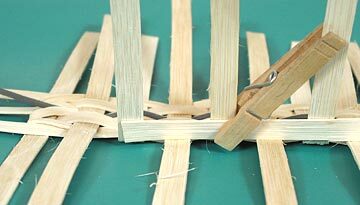 Twine around your basket leaving the long ends of the #2 round reed on the inside of your basket when you’ve completed three rows. (You’ll pick these ends up and resume weaving on rows 8 - 10.) To add another length of #2 round reed, at anytime, just secure the ‘old’ end as shown in photo in step 14 and secure the ‘new’ end alongside. 16. After weaving the 3 rows of twining above, you are ready for Row 7. 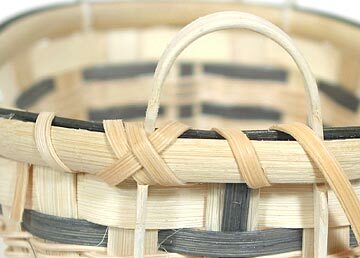 Weave the next rows of your basket as follows: Row 7 1/4” dyed reed Rows 8-10 #2 round twining Secure final ends of #2 round as shown. 17. The final row of your basket is the rim row. It should be slightly narrower than the width of your rim. 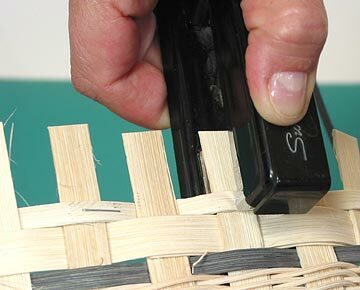 Soak a length of 1/2” natural reed and cut it lengthwise so that it is slightly narrower than 3/8”. 18. Staple the top row of weaving in 10 or 12 places. Staples must penetrate the weaving and a stake. 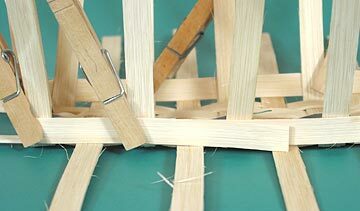 Squeeze each staple with a pair of pliers to keep the pointed ends of the staple tight against the basket. 19. 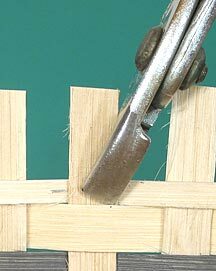 Cut all the 1/2” stakes flush with the top edge of the basket. Do not cut the 1/4” dyed reed. 20. Wet the ends of the 1/4” dyed reed at the top edge of the basket and, using a packing tool, feed each end downward underneath the weavers on the outside of the basket. Cut to length at the edge of the base. 21. Sand handles and taper the “legs” a bit with your carving knife if needed. Check the little shelf notches to be sure they are deep enough to accept the rim material; sand if needed. 22. 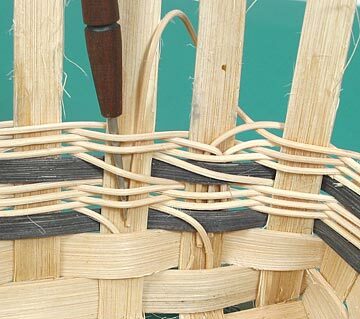 Attach one handle to each end of your basket, inserting the “legs” underneath one section of twining and one row of 1/2” flat reed. Align notches as shown. 23. Measure the circumference of the top of your basket and add 3 inches to that measurement. Cut a piece of 3/8” flat oval to this length for the outside rim. 24. Cut another piece of 3/8” flat oval 2 inches shorter than the outside rim piece for your inside rim. Sand both rim pieces then soak them in water for several minutes. 25. In order to form a smooth overlapping joint, you need to carve some of the thickness from both ends of each rim. 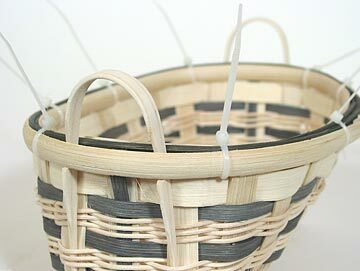 Using clothespins, attach the rims around the top row of your basket with the flat side of each rim touching the basket. Place outside rim securely into handle notches. 26. Mark each rim where it overlaps itself—mark the round side of one end of the rim and the flat side of the other end. 27. Remove the rims and, with a knife or hand plane, carve the flat side of one end and the round side of the other end to form a smooth overlapping joint as illustrated in Fig.1. 28. Soak the #3 round dyed reed. This material is your rim filler--it fits between the inside and outside rim to cover the top edge of your basket. 29. 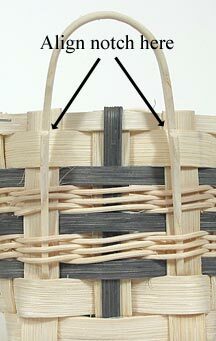 With the flat side of the rim touching the basket, and the overlap falling to the right of center on one long side of your basket, secure the outside rim to the basket with clothespins. Place the inside rim around your basket, overlapping to the left of center on the same side. 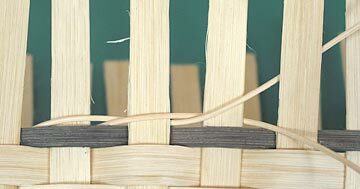 Beginning at the inside rim overlap, place 2 pieces of #3 dyed reed between the rims and secure both rims and rim filler to the top row of your basket with cable ties. Trim the #3 to the correct length when you complete the lashing. 30. 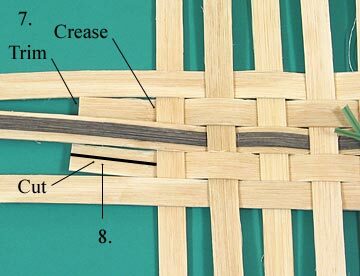 With a wet piece of 11/64” flat reed, begin lashing in a space between two stakes just beyond the outside rim overlap. 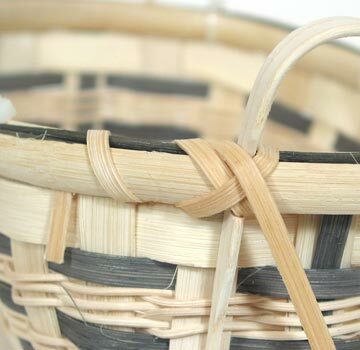 Be sure to orient the lashing material so that its smooth side will be to the outside of your basket. Secure one end of the lashing under the inside rim, beneath the #3 round filler and under the outside rim as shown in Fig. 2. 31. Working left to right from the outside of your basket, bring the longer end of the lashing over the rims and between the next two stakes from the outside to the inside of the basket just below the bottom of the rims. Pull this stitch tight. Continue stitching and pulling each stitch tight as you work your way toward the handle, removing cable ties as you go. 32. See photos showing lashing stitches at each “leg” of your handles. Pull each stitch very tight as you lash. 33. Trim #3 round dyed rim filler pieces so their ends fall underneath a lashing stitch when you reach that area of your basket. 34. Keep lashing wet as you work. To end, trim the 11/64” flat where you began and place your final stitch through the space. Using a packing tool, work the end of the lashing underneath the inside rim, under the fillers and underneath the outside rim, pulling tight, before trimming. Enjoy!